Coming up with just one word to describe Hasta La Muerte ($1.99) is easy, it’s different. Different in that it doesn’t play much like any other games on iOS these days, and has a crazy visual style to go along with it. Hasta La Muerte has you moving around levels collecting souls and finding the exit before being killed by giant mustaches. You’re encouraged to do this as quickly as possible, with the incentive being a higher score to impress your friends. 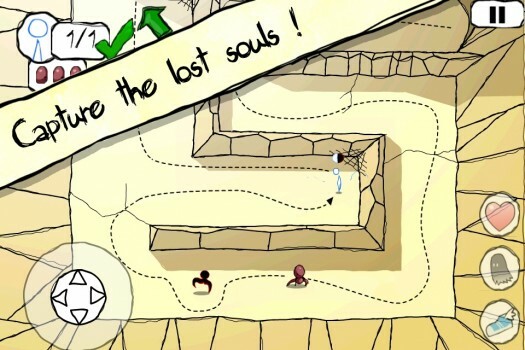 Each level has a certain amount of souls to collect, and each level is harder than the last. Fortunately, the controls in the game work great making each level seem possible to master. I’ll admit, I still get a nasty pit in my stomach every time I load up a mobile game that uses a virtual d-pad. You can’t really blame me, they’re not native to the platform and mainly exist so that game designers can rely on controls that have worked for over 30 years. Hasta La Muerte has changed the way I feel about d-pads on iOS because whatever secret sauce they’re using just works. Moving the joystick isn’t a slippery motion, it’s as fluid and accurate as we’ve always wanted it to be. The controls work well, yet there are still problems when it comes to understanding what the game wants you to do at any point in time. An earlier level throws a boss at you with vague instructions, in which you are meant to figure out that the boss will only take damage after you force him to crash into large mouths on the ground. Another and even worse example comes just a bit later as you’re forced to confront enemies that will kill you quickly, and you have to get around them by using a ghost mechanic that barely works. Having these issues is a huge blemish on a game that seems to do everything else right. If there was ever a case for “addition by subtraction," this is probably as good of case as any. Adding in more depth to the game is normally welcomed so long as a proper introduction follows it. One other bright spot for the game is its unique graphical style, looking like it was completely hand-drawn in a grim setting. Each of the enemies and characters move in unsettling ways, which is only driven further by the lack of color used. There are 27 levels for you to trek through in Hasta La Muerte, which doesn’t seem like much especially compared to other games of this type. Still, it’s probably enough to keep your attention for a few hours at least. Beyond that, you can share your level scores with friends via Game Center and OpenFeint, both of which seem to be preferred networks in the iOS game community. Taking a unique approach for a game is always a risk, and one you should be glad BulkyPix took with Hasta La Muerte. For each of the game’s faults, there’s usually something else that’s equally deserving of your attention, and that means it’s definitely worth your time to at least check out.